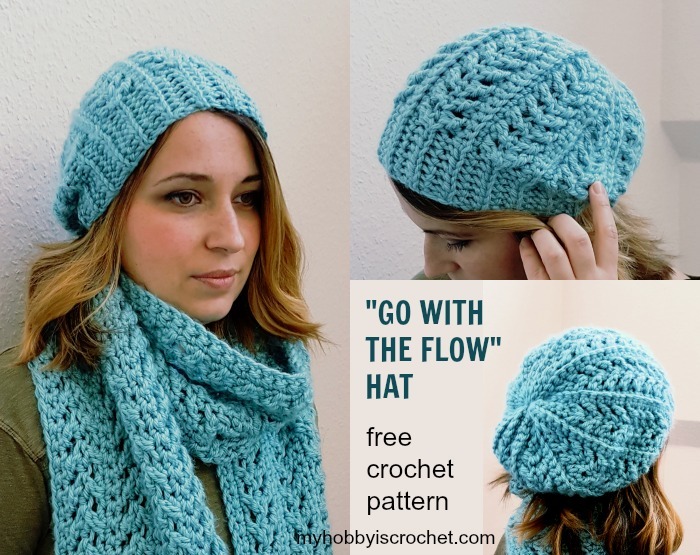 Many of you have requested a matching hat to the Go with the Flow Super Scarf. So here it is! I’m very pleased how it turned out and I hope you will love it also! Same as my Sparkle Ruby Slouch, this hat is worked sideways in rows, back and forth, then seamed together at the back with an almost invisible seam. The height of the hat will be determined by the length of the foundation chain and the hat circumference will be given by the number of rows. 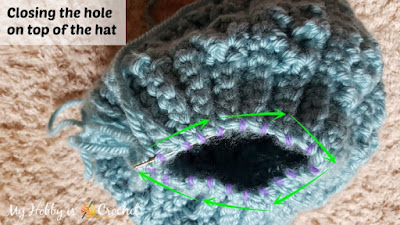 You will not need to make any increases or decreases, the hat crown will be formed with the help of the shorter stitches: sc and sl st worked into the back loops. 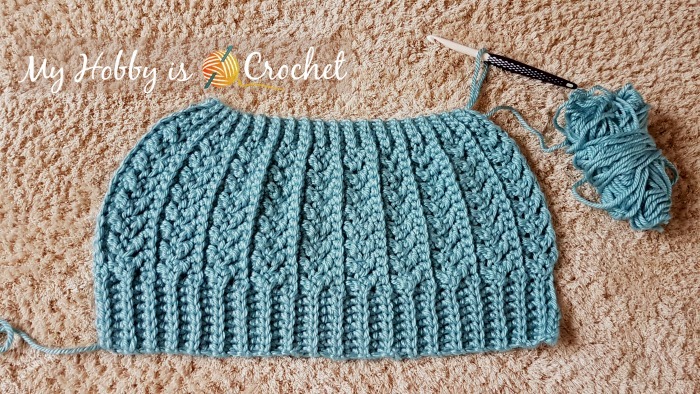 This hat pattern is not very hard to crochet, you will only have 4 rows repeats, but before you start working on the hat, be sure to understand how to crochet the special stitches used. 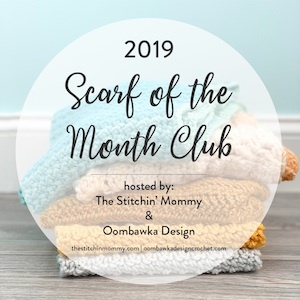 Please check out my STEP BY STEP PICTURE TUTORIALS for the Crossed Stitches used in the Go with the Flow Scarf&and theRibbing worked with the Yarn over- slip stitch back loops only! - back bump of chains Click here for my picture tutorial. 1) Yarn Over Slip Stitch (yo-slst): Yarn over (yo) and insert the hook into 2nd chain from hook; yarn over and draw the yarn through the chain (You have now 3 loops on the hook). Having the 3 loops on hook, pull/slip the first loop on hook through the next 2 loops on hook to complete a Yarn Over Slip Stitch (yo-slst). Click here for my PICTURE TUTORIAL! 2)Yarn Over Slip St itch Back Loops Only (yo-slst-blo): work the stitch as described above, but inserting the hook only into the back loops of the stitches. 3) Back Cross Double Crochet (bcr-dc): sk 1 st, work 1 dc into the next st, 1 dc back into skipped st going behind the last dc just made, so as not to catch it. 4) Back Cross Half Double Crochet (bcr-hdc): sk 1 st, work 1 hdc into the next st, 1 hdc back into skipped st going behind the last hdc just made, so as not to catch it. 5) Front Cross Double Crochet variation (fcr-dc): sk 1 st, work 1 dc into the next st, 1 dc back into skipped st going in front of the last dc just made so as not to catch it, inserting the hook from back of the work to the front. 6) Front Cross Half Double Crochet variation (fcr-hdc): sk 1 st, work 1 hdc into the next st, 1 hdc back into skipped st going in front of the last hdc just made so as not to catch it, inserting the hook from back of the work to the front. Leaving a long tail - that will be used at the end to sew the sides together, chain 30 with an 8 mm crochet hook. Row 1: slst in 2nd ch from hook and slst in next ch, 1 sc in each of next 19 ch, 1 yo-slst in each of next 8 ch. Row 2 (right side): ch1 tight, turn, work 1 yo-slst-blo in each of the next 8 sts, 1 sc blo in each of next 19 sc, 1 slst blo in each of next 2 slsts. Row 3 (wrong side): ch1, turn, 1 slst blo in each of next 2 slsts, 1 sc blo in each of next 3 sc, work 1 bcr-hdc over next 2 sts, work 7 bcr-dc over next 14 sts, 1 yo-slst-blo in each of the next 8 sts. Row 4 (right side):: ch1 tight, turn,1 yo-slst-blo in each of the next 8 sts, work 7 fcr-dc over next 14 sts, 1 fcr-hdc over next 2 sts, 1 sc blo in each of next 3 sc, 1 slst blo in each of next 2 slst. Row 5 (wrong side): ch1, turn, 1 slst blo in each of next 2 slsts, 1 sc blo in each of next 3 sc, 1 sc in each of next 16 sc, 1 yo-slst-blo in each of the next 8 sts. Row 6 (right side): ch1 tight, turn,1 yo-slst-blo in each of the next 8 sts,1 sc blo in each of next 19 sc, 1 slst blo in each of next 2 slsts. Repeat rows 3 - 6 until you have 10 braidings total, the last row should be as row 4 with front cross stitches! See the picture below! Cut yarn leaving a tail. Fasten off. Joining the sides: With right sides facing together, hold Row 1 edge on last row edge as pictured below. Thread a yarn needle with the long tail you left at the beginning of the foundation chain; sew the edges together inserting the needle through the front loops of last row and unused loops of foundation ch. Fasten off. With yarn needle and the long strand of yarn, weave yarn through slip stitches at top of hat. Cinch together to close space, and fasten securely. Weave in all ends. I would love to see your projects made using this pattern! Please share your pictures on Myhobbyiscrochet Facebook Page!